Using Mastercam CNC Programming Software, MASON MACHINE & TOOL produces CNC machined parts accurately and on time. Programming from your blueprints or CAD models, we can machine complex work and hold close tolerances using our 3 axis CNC milling equipment. 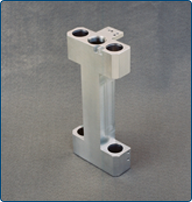 The tolerances that we commonly hold range from +/- .005” to +/- .0005”. Your part files can be imported in just about any CAD format including dwg, dxf, igs, sldprt, stp and parasolid. MASON MACHINE & TOOL provides precision prototype and short run CNC milling. We also do CNC milling for special machine builds and tooling orders. We are not a high production machine shop. Purchase orders that we receive are usually for items in quantities of one to twenty-five. MASON MACHINE & TOOL does CNC milling on a variety of materials, in all shapes and sizes, using efficient high speed machining techniques. Our CNC milling capacity is 29” X-axis, 20” Y-axis and 19” Z-axis. Whether working with bar stock or plate, MASON MACHINE & TOOL has the expertise to give you quality CNC machined products at very competitive rates.